Watching the Samsung Galaxy Note 9 launch was tough. After watching a decade of phone launches waxing and waning in bombast, the new Note launch felt like it was running on fumes a little bit. 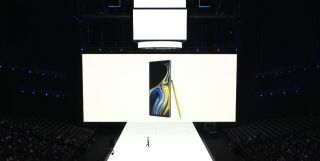 Let’s skip past the lack of upgrades on the new Galaxy Watch, the ‘and-me’ smart speaker and the decision to have ‘Mr Doodle’ on stage drawing with a product launched a few weeks ago, and jump straight to the Note 9. There were a lot of marketing words spoken about the handset, about how it was ‘inspiring’, ‘removed borders and interruptions’ and basically worked with you… a lot of words that don’t really tell us much, meaning that most of us were left wondering ‘what’s actually new here?’. That’s the issue - smartphones are now so capable that there’s not really that much further to go, so unless a brand materially changes the design and ways of using the phone (as Apple did with the iPhone X) then there’s not much to really excite consumers. It makes sense, until you think about the excitement the launch has generated around the globe (as Samsung has spent big to make sure that it’s being advertised everywhere, the link to the live stream promoted all over the globe). Teasers, leaks… we, as the media, lap it up and disseminate every morsel to the general public. Marketing is all about getting a product into the minds of prospective buyers, and that’s what a massive event does, with every tech outlet attending if they can. On the outside, it’s easy to say that the Samsung Galaxy Note 9 is just the same as last year, with some speed upgrades inside and a slightly bigger battery. It would be a fair assessment, but misses the bigger picture. Firstly, this is a handset that - despite Samsung trying to make it appeal to the masses - is for the power user, not the average phone-buying consumer. That 4,000mAh battery is a huge upgrade on what was there before (and validated by an independent body as very unlikely to catch on fire this time). The Note 8 has uninspiring battery life, but if the new Note 9 can last a little longer and make it comfortably through a day (and well into the next day) that’s a real win for buyers and is a genuine upgrade for Samsung. That is a good thing, indeed. The power upgrades inside aren’t that massive, perhaps, but 6GB or 8GB of RAM is pretty huge, and should expand the possibilities of what the phone can do. It’ll be able to handle the DeX experience (where your phone can function as a computer with a simple cable) with more aplomb than before, and the slowdown over the course of your time with the handset should be reduced too. The screen’s 0.1-inch increase is actually a little more annoying, as the phone has increased a touch. Yes, only by 2mm, but that’s still a wider grip that hands have to deal with on an already-large phone. Samsung made a big deal about how it ‘invented’ the big phone with the first Note, but it seems hell-bent on seeing how much bigger it can get away with. Then there’s the storage increase: you can now get 512GB of internal storage, along with another 512GB through a microSD card. That’s 1TB in a phone (even after the Note 9 has gobbled up 19GB of space just doing its own thing, right out of the box), which is larger than many laptops (as Samsung was keen to point out). But… why? Why would anyone need that much space? Samsung pointed out that you’d have enough space for apps, games and movies… but it’s hard to see many people topping that out. Even if you downloaded all the Spotify, Netflix, Amazon Prime and offline movies you wanted, and filled the phone with massive games, you’d still struggle to top 256GB of space. All this together corroborates the point: the Note 9 isn’t the right choice for the average user. For them, it’ll be seen as incremental upgrades that are there for the sake of seeing what can be done on a phone. The volume of people that truly need 8GB of RAM, 1TB of storage and a 6.4-inch screen, along with a Bluetooth remote (which the S Pen has become) is tiny, and yet Samsung hopes to sell millions of units of this phone. It’s aiming to please the reams of buyers who just like the best spec no matter what, those that lust after power just… because. Another good thing again - as long as high spec is truly what you’re after. The first reaction to the price, for many, will be one of outrage. £899 / $999 for the base model? £1049 / $1249 for the 8GB / 512GB option? Those just aren’t smartphone prices. But if you dig a little deeper - for the cheapest version - it’s not that bad compared to the launch price of the Note 8. There’s a much larger battery, likely improved screen technology, an improved camera, a more capable S Pen, more capacity as standard and stereo speaker for your money. That’s quite a lot of change for a modest price rise - for the power user, it’s probably within the range of what they might have expected. If you’re happy enough with the base model, the perhaps it’s best not to interrogate the larger capacity version. For another £150 / $249 you’re getting a bit more RAM (useless to most) and far more internal storage. But in reality, sticking a memory card in the base model for £75 / $100 would give you more than enough space and it’s hard to see why you’d need the extra RAM in most cases… so that’s a premium that many won’t need to pay. It really depends on how much you value Samsung’s optimization on whether you think this is a worthwhile purchase - there are many phones from China especially that offer similar specs, and for far less cash. They lack the luster of the Samsung brand, sure, but phones crossing a thousand dollars just feels too much - and shows that brands are struggling to offset the slowdown in smartphone growth, needing to up profit margins to compensate. Here, we’d expect to laud the Note 9 as a harbinger: it usually provides clues for the future of the Galaxy S series. The Samsung Galaxy S10 should have a much larger battery, for starters, and it sorely needs such a thing. That’s pretty much it though - as the camera uses the same tech as in the Samsung Galaxy S9 Plus, the stereo speakers aren’t new, and the S Pen is locked to the Note series, so the upgrades there aren’t going to make much difference to the S10. Perhaps there will be more capacity, but most users won’t need that and it won’t be the lure that it is for the ‘Note community’, as Samsung calls them. Could the ‘artificially intelligent’ features of the camera make it to the S10? Probably, but then again they could be retroactively added to the S9 pair as well. It’s hard to see the Note 9 doing incredible numbers in terms of sales. That’s simply because the smartphone market is stagnating and there’s nothing headline-grabbing here, there’s just a few smart improvements. Then again, 2019 could be the year that things really change in terms of the brand’s smartphone design, so reading anything into this year’s models for the future could well be moot - if that does happen, then the Note 9 was almost certainly a smaller upgrade on purpose. One thing is for certain though: if Apple keeps pushing up its prices, and sells units still, Samsung is going to do the same for its flagship phones too, rather than providing a cost-effective alternative.